Founded in 2002, Ultimate Services has significant experience in building high-value estates and custom homes in Lake Havasu City and the surrounding areas. No matter the size of your job, we are happy to assist with your interior and exterior contracting and remodeling projects. Ultimate Services was founded in 2002, but our team has been in the construction industry for more than 30 years. Since our founding, we have worked with clients on jobs of all sizes, including building full estates and custom homes valued anywhere from $450,000 to more than $3.5 million. Today, we are pleased to work as remodeling contractors in Lake Havasu City, AZ, Kingman, Bullhead, and Mohave County, assisting clients with a wide variety of interior and exterior general contracting and remodeling projects of all shapes and sizes. Our efforts have earned the team at Ultimate Services a #A ranking from Angie’s List and an A+ rating with the Better Business Bureau in the Lake Havasu City area. We use eco-friendly materials that do not include any harsh chemicals. We are extremely flexible in our designs so we can help you create your dream property. We are certified appliers of products from Semco, specifically their Seamless Surface Effects product. We are able to take on projects of all sizes, values and types. We are extremely experienced in a wide variety of construction jobs. For more information about the construction services we provide to our clients, contact us for home remodeling in Lake Havasu City, AZ today. ""RICK" & his excellent, professional & talented team are really quite a catch!! After so many horrible, sloppy, deceitful people who conn & ..."
"Ultimate Services and there crew added a addition to my home to create another 650 sq.ft for my children's room's and an extra full bath, c..."
"Wow!! 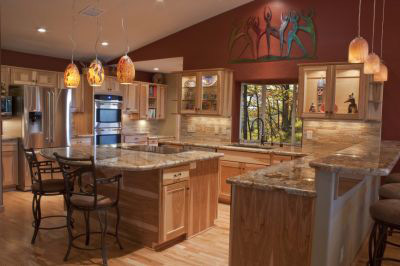 Ultimate Services show up when they say they will, and all the work was done on time, within budget, per the quote, and in an extremel..."
"Ultimate Services came through brilliantly with our home remodeling. Everything was fulfilled on time and professionally. We also took advan..."
"Ultimate Services provides a very professional painting service in Lake Havasu City, AZ. They painted all of my first floor rooms and remode..."